It's time I make more effort to encourage someone very near and dear to me. My mama is needing an extra loving boost these days, so I thought I'd use my creativity to make her something she could use to empower herself. Living in different states makes it hard to cheer someone up when they're going through a rough patch. She's getting this care package by snail mail as an early Valentine's Day gift. 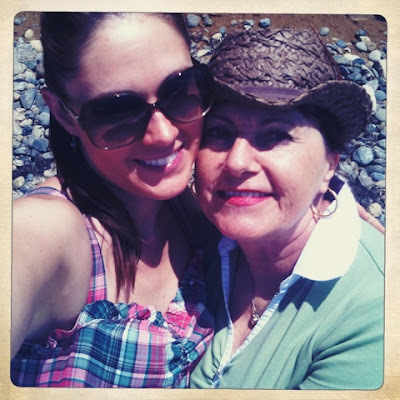 I've learned some important lessons about gratitude, self-care and choosing joy that I'd like to share with my mama. (It's my turn to teach her something!) I've been using my gratitude journal more lately as a way to manifest joy in my life. It serves as a reminder that I have much to be thankful for, even if it's just the everyday ordinary little blessings that make up my days. It forces me to slow down and reflect on what is working rather than allowing my inner critic to convince me that something is lacking. 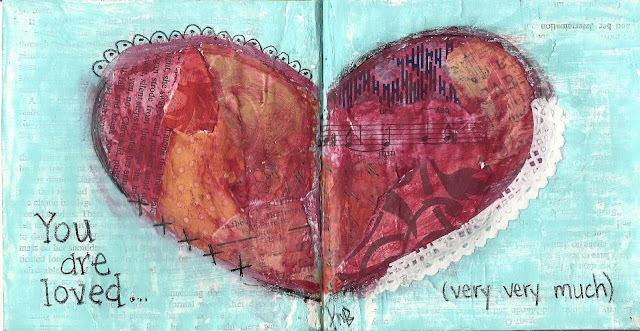 Gratitude journals are a wonderful way to recognize the good things in our lives and to acknowledge that we have the power to create our own joy. When we're stuck in a rut, when life feels dismal and lonely, or just when we want to honor the abundance in our lives, recording our gratitude can help us focus on the positive. 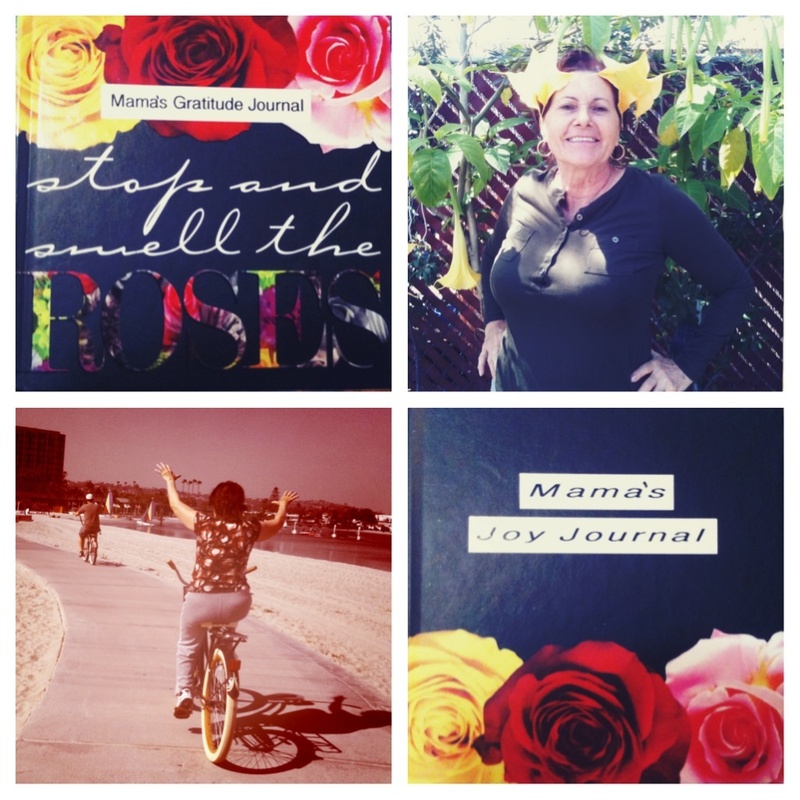 My gratitude journal has become a sort of spiritual practice for me and I hope it does the same for Mama. Knowing what brings me joy and setting aside time in my days to do those things (even in small doses) has been the greatest form of self-care. My mom is always doing for others and disregarding her own need for rest and playful rejuvenation. It has helped me immensely to have a list of self-care acts that I can dip into when I'm burned out and nothing joyous comes to mind. I think my mom could use her own bank of ideas. I bought a blank journal that was perfect for Mama, an avid gardener and lover of roses. The quote, "Stop and smell the roses," will encourage her to slow down and find joy and gratitude in the little things. I altered the front and back cover slightly by adding title strips with my label maker. I made the journal double-sided, one side to be used as a gratitude journal, the other as a joy log where she can document her efforts at growing more happiness in her life. I created a little art journal spread on the center pages where her double-sided journaling will come together. I'm including some silly pictures of her that I know will make her smile. My mom has helped me find my courage so many times. It's time I help her do the same.